Comfort Hose State Theme Arch Shape Address Plaque - - for any U.S. state. Personalized for you with a silhouette of your state inside the large arch above your address. Made in USA. Wall mount. 16"W x 11.75"H custom sign with a one- or two-line address. Pick your state. Any state! 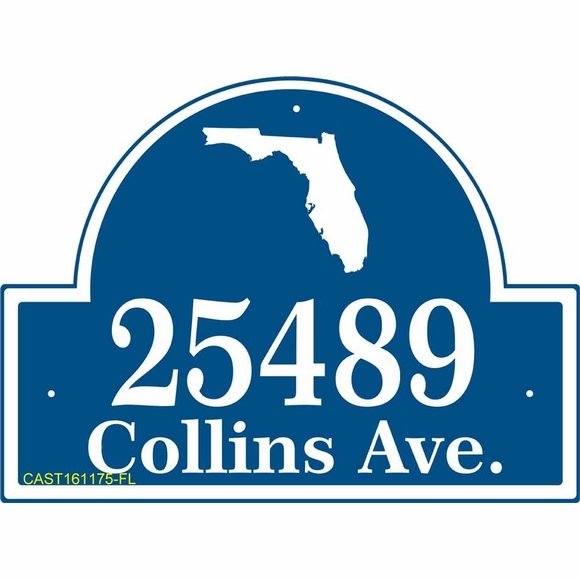 Our personalized state theme address sign is available for all 50 U.S. states. Sturdy, UV-stabilized laminated acrylic construction with engraved wording, image, and border. Note: the style number (CAST161175) visible in the lower left on the sample signs is for internal use only and is not on your personalized sign. Engraved border highlights the arch shape and is the same color as the characters. Personalized state theme address plaque crafted in the USA.